Beachfront condo #410 is a 2 bed/2 bath corner unit in building 10, on the southern edge of the property. Corner units in end buildings like this mean extra windows with more expansive ocean views & extra light. In this case it also means an extra-large lanai that faces both west & south. Breakfast on the lanai and enjoy an extra bit of local culture when single & double outriggers launch from the adjacent canoe club for practice paddles and colorful regatta & local races. Pick up fresh local food to prep in the full kitchen, finish on the gas grills, then dine on the lanai. In winter the whales put on a show for free, but all year round the sunrises & sunsets (also free) will stun you. Both bedrooms have en-suite bathrooms with walk-in showers. The master’s king bed, the second bedroom’s twins & the sleeper sofa in the living room allow for 6 guests. Tile flooring, flat screen TV with complimentary cable, WiFi, local phone. Central AC, ceiling fans, in-unit washer/dryer. We can’t say enough about our stay at this VRBO. The pictures don’t lie....the view from the balcony is amazing. Right on the shore, lovely beach to enjoy, and even handy supplies from the ABC store and the Sugar Beach Bake shop across the street. 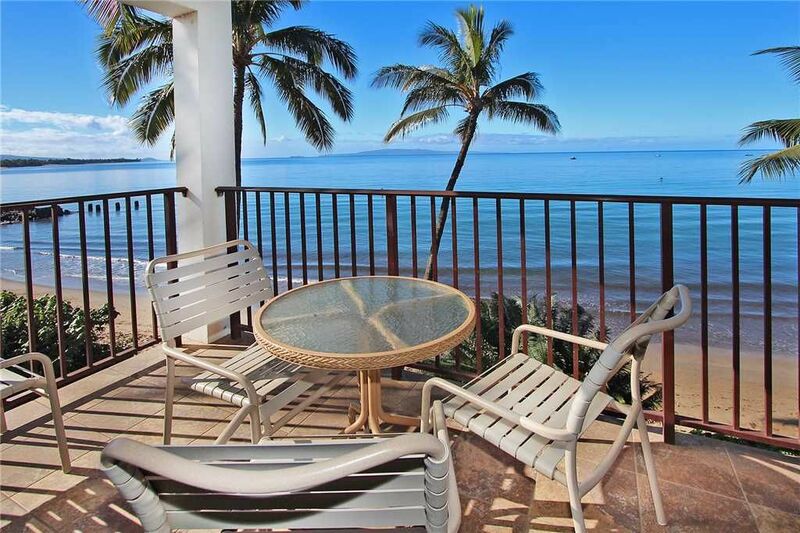 Great location away from some of the business of central Kihei. We hope to return! Mahalo for your review! Thank you for all of the tips and recommendations! We hope to see you again soon! Aloha. We had a great time on our trip in June and the condo was exactly what was described online. The view from the patio and windows was amazing and we all enjoyed listening to the waves every day. May want to keep screen door closed when sliding glass door is open bc we did notice some bugs if you forgot to do that. Master bed is very soft (for us). Both my husband and I found it too soft for our liking but the kids room/beds were fine. Kitchen was well stocked with everything you need if you want to cook. Very close to some good restaurants- Pizza Madness and South Maui Tacos. Also super convenient to get to and from airport which was nice since we had one person in our party that had to leave early and it was no problem to zip him over to the airport. We really enjoyed having the ABC Store, Bakery, Shave ice place and farmer's market right across the street. We went to all of them. We literally did stuff all over the island and it the condo was in a great location for all of it. Must do: surfing lessons (Goofy Foot), Iao Valley Hike, snorkel Molikini Crater (Trilogy), Nakele Blow Hole, Road to Hana, Haklele. Pass on the aquarium-pretty sub par, expensive and not worth the time. However- their gift shop is nice but you can go in to it without paying for the aquarium. All in all a great trip to Maui. Thank you for your review! We're glad you enjoyed the condo and it's location. It sounds like you had a great time! Aloha. Great location with a perfect view! This is a corner unit so you have a little more view than the other units. It is right beside the ocean so if you leave the window in the bedroom and deck open you can hear the waves. The unit is very well stocked with all the items you might need for a wonderful stay. We loved the farmers market, ABC store, and shaved ice being across the road. We also enjoyed watching the chickens in the parking lot across the road. We never had a problem finding a parking space. If we had questions all we had to do was call the number on the refrigerator and if he didn’t answer then he would always call right back. The only slightly negative was the canoes next door would have a group go out at 5 AM on some mornings and would wake us up but I could shut my window and I wouldn’t hear them as much but were kinda fun to watch. Overall this was a perfect vacation!! Mahalo for your review. This unit does have a beautiful view and we're happy to hear you enjoyed your time with us. Come see us again soon! Aloha. The condo was perfect for the 4 of us. Good location, near shops and ocean front access. We're happy that you folks enjoyed your time with us! We hope you'll come see us again soon! Aloha.